George Bush was lazy. When I called him he just ignored me. But when I was sad he always comforted me. Gosh, I loved that cat. It is tempting to resolve an obvious reference directly. So when the name "George Bush" comes along you look up entity by that name in the knowledge base and directly attach the new statement to it. This implementation reminds me of the distinction between sense and reference. The reference of a word is the object it denotes in the world. The sense of a word is the cognitive representation of the object in an agent. In our case both sense and reference are representations. But one of them, reference, is more absolute. The sense of a word is here an object in working memory whereas the reference of a word is an object in long term memory. Now when the last sentence is parsed, we will drop the external reference when we find out we are in error (how we do this is another story). The temporary object can later be added as a new entry to our knowledge base. 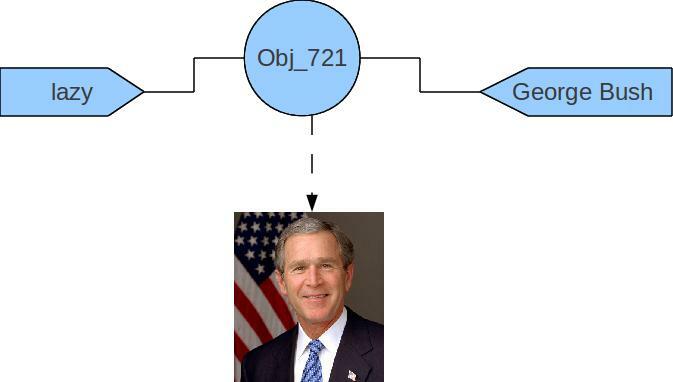 A second entry with the name George Bush. Naming a cat after George Bush is not as unlikely as it may seem. 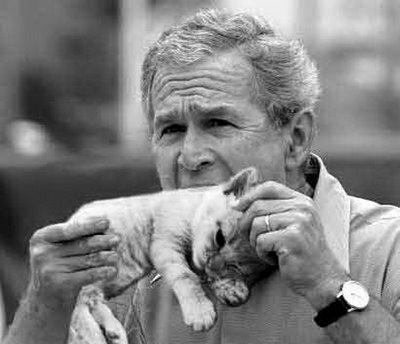 George Bush loves cats. And no, we don't call George Bush a cat. We're not hippies. I am reading "Linguistic Semantics" by William Frawley. A wonderful book full of new ideas. 22-07-11 21:54 - Parsing "Was Ada Lovelace a daughter of Lord Byron?"